The Disaster Recovery Preparedness (DRP) Council was started last month by IT business, government and academic leaders with its mission to increase Disaster Recovery Preparedness awareness and improve DR practices. Here are some initial results from the online survey that organizations around the globe have participated in. The Disaster Recovery Preparedness Benchmark (DRPB) Survey was designed to give BC, DR, compliance audit and risk management professionals a measure of their own preparedness in recovering critical IT systems running in virtual environments. 72% of survey participants, or nearly 3 out of 4 companies worldwide, are failing in terms of disaster readiness. 36% lost critical apps, VMs, critical data -files for hours; 11% of the companies lost these for days. The cost of losing critical applications has been estimated by various experts at $5,000 per minute. 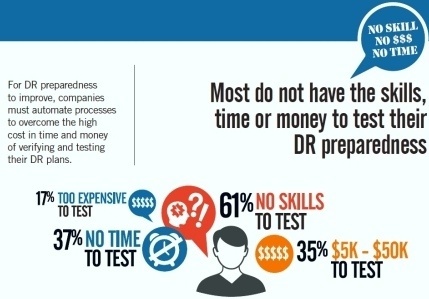 When companies do test their DR plans, 70% do not pass their own tests. The DRPB survey provides a benchmarking score from 0-100 that measures the implementation of IT disaster recovery best practices. DRPB benchmarking scores parallel the grading system familiar to most students in North America whereby a score of 90-100 is an A or superior grade; 80-89 is a B or above average grade; 70-79 is a C or average grade and 60-69 is a D or unsatisfactory grade. Below 60, rates as an F, or failing grade.